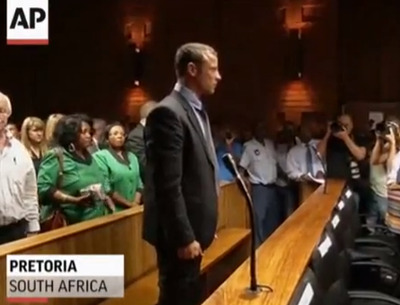 The bail hearing in the Pistorius case represents a mini-trial to determine if he will remain in custody until a trial or can be freed with conditions. defence lawyers offered written statements from the athlete and his friends to state their case. By offering the affidavits, the defence was able to enter the evidence without having to put their emotional client, who has broken down weeping a number of times in court, on the stand. Prosecutors offered their own version of events and called the lead police investigator, Detective Warrant Officer Hilton Botha, to give testimony. But by putting Botha on the stand, they opened him up to detailed cross-examination by Pistorius’ lead defence lawyer, Barry Roux. Botha has since been dropped from the case. Pistorius faces the harshest bail requirements in South African law after the judge agreed with the prosecution’s premeditated murder charge for the purposes of bail. Pistorius’ lawyers must prove there is an “exceptional” reason to have him freed before trial. They also have to show that he doesn’t represent a flight risk, that he will not intimidate witnesses and that he won’t commit acts of violence or encourage others to do so. If Chief Magistrate Desmond Nair decides Pistorius might violate any of those terms, he can order him held until trial. If bail is denied, Pistorius can immediately appeal to a higher court. Pistorius is currently being held in Pretoria’s Brooklyn police station, but those denied bail typically go to a prison. South Africa is one of just a few countries in the world that that has a court system that takes root in Roman-Dutch law. Because of this, those appearing in criminal trials do not have the option of a jury trial, which is common in the United States and other countries. Instead, a single judge will hear the entire case and then rule on a person’s guilt or innocence.